Since grass-fed beef is extremely low in fat, coat the meat with olive oil or your favorite light oil for flavor enhancement, to help prevent drying and sticking. For safe handling, marinate thawed meats in the refrigerator. Choose a marinade recipe that doesn’t mask the delicate flavor of grass fed beef but enhances the moisture content. A marinade using lemon, vinegar, wine, beer or bourbon is a great choice, but use slightly less than for commercially raised beef. Grass-fed beef cooks more quickly so the liquor or vinegar won’t have as much time to cook off. If you don’t have time to marinate or prefer the flavor of a rub: Coat thawed meat with your favorite rub, place on a solid surface, cover with plastic wrap, and pound a few times with a meat mallet or rolling pin to break down the connective tissue. This helps to tenderize the meat and pushes the flavors into the beef. Don’t go overboard and flatten your beef unless your recipe calls for it. Cook grass-fed beef RARE to MEDIUM RARE. Overcooking will toughen grass fed beef. Due to high protein and low fat levels, grass-fed beef usually requires 30% less cooking time and will continue to cook when removed from heat. Remove the beef from your heat source 10 degrees before it reaches the desired temperature. If you like well-done beef, then cook your grass fed beef at very low temperatures in a sauce to add moisture. 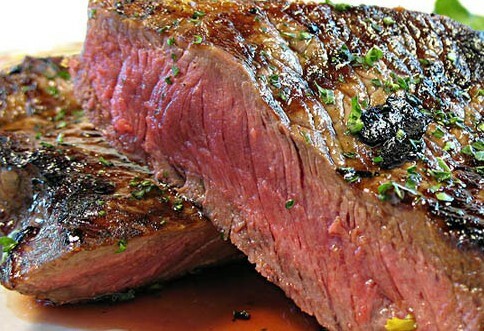 Stove top cooking is great for any type of steak. You have more control over the temperature than on the grill. When grilling, sear the meat quickly over high heat on each side to seal in its natural juices and then reduce the heat to medium or low to finish the cooking process. Also baste to add moisture throughout the grilling process. Don’t forget grass-fed beef requires 30% less cooking time so watch your thermometer and don’t leave your steaks unattended. When roasting, sear the beef first to lock in the juices and then place in a pre-heated oven. Reduce the temperature of your commercially raised beef recipes by 50 degrees i.e. 275 degrees for roasting or at the lowest heat setting in a crock pot. The cooking time will still be the same or slightly shorter even at the lower temperature. Watch your meat thermometer and don’t overcook your meat. Use moisture from sauces to add to the tenderness when cooking your roast. When preparing hamburgers on the grill, use caramelized onions, olives or roasted peppers to add low-fat moisture to the meat while cooking to compensate for the lack of fat. Make sure you do not overcook your burgers. Use a thermometer to test for doneness and watch the thermometer carefully. Since grass-fed beef cooks so quickly, your beef can go from perfectly cooked to over-cooked in less than a minute. Before serving, let the beef sit covered and in a warm place for 8 to 10 minutes after removing from heat to let the juices redistribute. Use tongs to turn your beef. Never use a fork as precious juices will be lost.